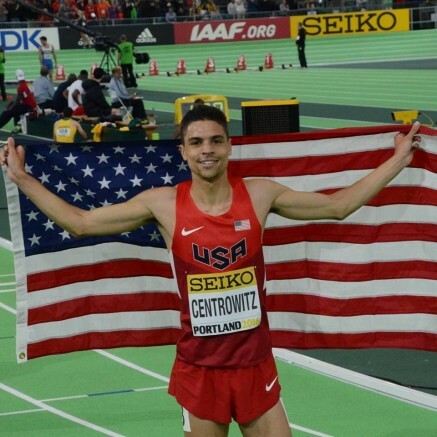 20th March 2016 – Matthew Centrowitz (USA) claimed his first global title in a brilliant 1500m final at the World Indoor Championships. A slow early pace saw the field closely bunched behind defending champion Ayanlew Souleiman who appeared to be trying to employ the same tactics he used to win the title last time of front running. However, after managing to repel several attacks he could do nothing as first Dawit Wolde and then Nick Willis burst into the lead with 400m remaining. Heading into this race Matthew was unbeaten in 2016 but with 200m to run and still in third he was going to have to show speed and strength over the last lap to maintain this record. However, he displayed both in abundance and in a battle for the line in the final 60m Matthew timed his run to perfection and crossed the line in 3:44.22 with a final 400m of close to 52 seconds. A world indoor title to add to the silver and bronze medals he has won outdoors. In his first international championships Vincent Kibet (KEN) acquitted himself well and finished in seventh position in 3:45.17. Another member of the Oregon Project who entered the championships with a perfect record in 2016 was Shannon Rowbury (USA). Here Shannon faced the tough challenge of Ethiopian world record holder Genzebe Dibaba over 3000m. Again a slow early pace saw the field jostling for position until Dibaba herself sped up and spreadeagled the field. Shannon used all her experience to not panic and gradually worked her way through the field and into medal contention. A strong finish saw Shannon get her just rewards for a brilliant indoor campaign with a third place finish and a bronze medal. Steph Twell (GBR) finished her indoor season with a fine sixth place and Nancy Chepkwemoi (KEN) was tenth. Laura Roesler (USA) narrowly missed a medal in the womens 800m as she took fourth place in 2:00.80. Having missed 2015 through injury Laura showed she is ready to challenge for major honours again.